I'm neurotic and proud of it. Wife to a gamer, mother to JED and owner of JED Packs. Always always juggling too many balls in the air! Be a fan of the Mighty JED! 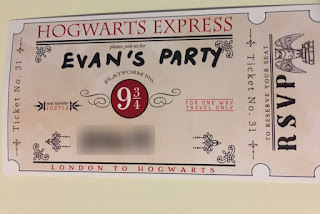 This post is part of a series for the twins' Harry Potter birthday party. There's too much for one post. This one is about the creative little bits that we created to make it more Harry Potteresque. There'll be others to come. Traditionally, we celebrate the twins birthday early in June. Having a birthday in June is great when you want to be anti-social and want nothing to do with people you go to school with. 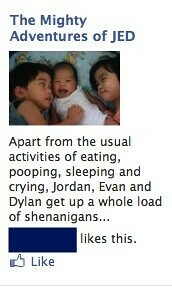 But the twins are far from anti-social. They love their friends. They love playing. And they love parties. So, having June birthdays means it's tough to find a time where we can catch a majority of their friends. 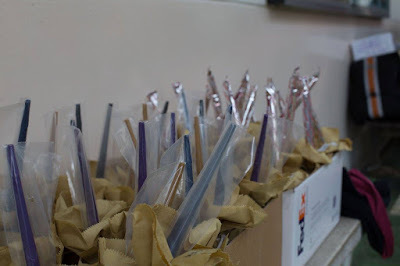 This year, they asked for a Harry Potter themed party because they love all things Potter. Unfortunately, we don't have a large backyard where we can play pretend Quidditch games and I don't have the time nor the constitution to create Hogwarts in my living room or a nearby rec room. The next best thing was to find them a venue that we could use where they could pretend to be Potter characters. Tangentially, they all do gymnastics with Dreams Gymnastics, where Jordan spends an inordinate amount of time. Because of that, we've gotten to know the coaches really well. So I asked them if they ran birthday parties and they said they did. Excellent. An open air gym with all the space in the world for kids to make all the noise they want to and tire themselves out nicely. An added bonus was that the coaches were Harry Potter fans and knew exactly what we had in mind without us needing to tell them. Or rather, they told me they had it under control and it was a surprise for the twins. So, the energy I would have needed to actually plan the party was all humming and buzzing to do something. All that, I needed to get out of my system. I did what any crazy mother would do. Channel it into making goodie bags that looked like broomsticks. I don't care if Martha Stewart has done time in prison, she still has great ideas and it looked like something someone like me, who had failed art, could manage. Instead of using twigs, I used full-sized plastic wands that I ordered online with brown sandwich bags I pulled out of our pantry and I was off. 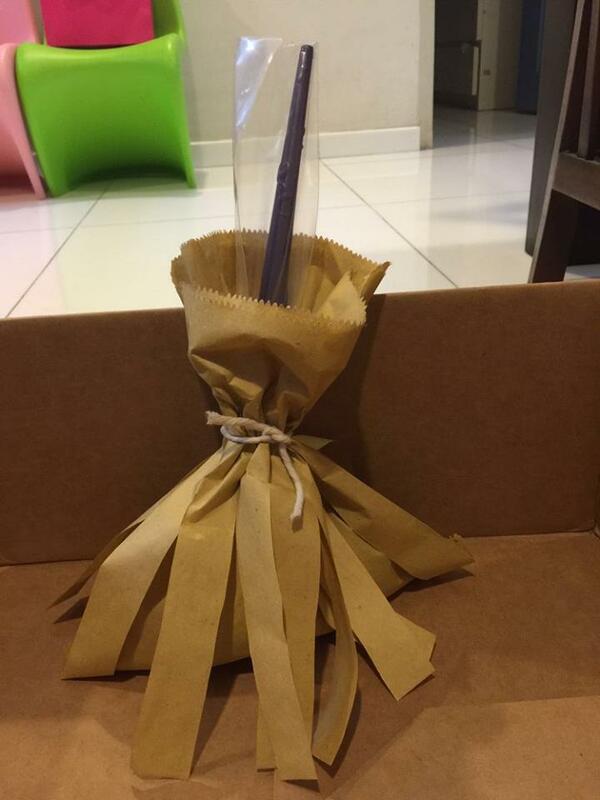 I filled it with stickers, snacks, tattoos and the wand then tied it up with twine. Me, the one who disappointed my mother with my lack of artistic dreams, created something that approximated a broomstick out of non-broomstick material. 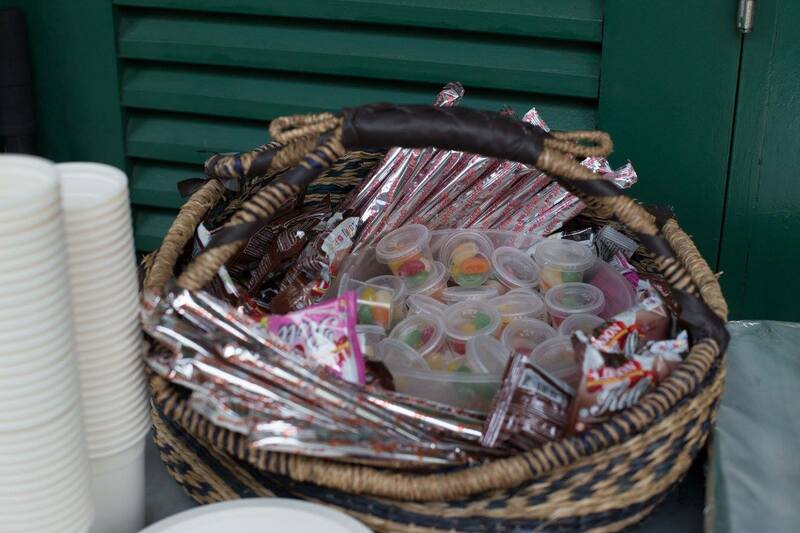 Harry Potter inspired snacks including Giant Pocky sticks as well as jelly beans and chocolate frogs. I wasn't the only one feeling some creative edginess. 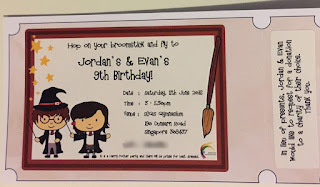 Packrat too and far surpassed himself when he came home with invitation cards. Yes, we're traditional that way. 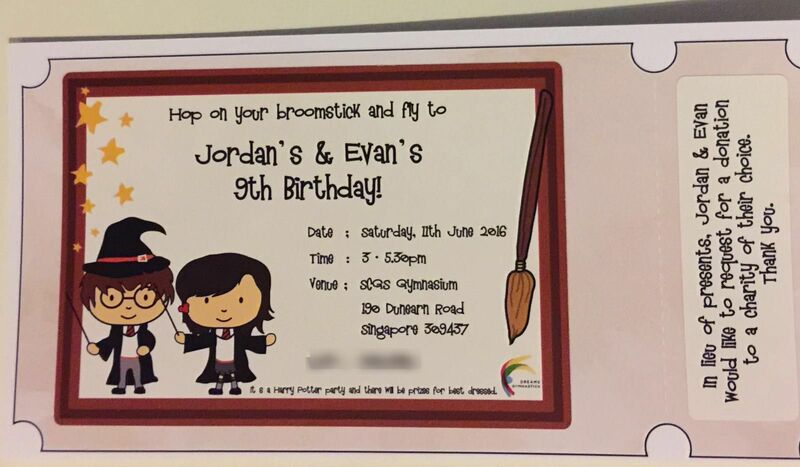 Paper invitations hand delivered instead of an electronic one that could be shared in a Whatsapp chat group. 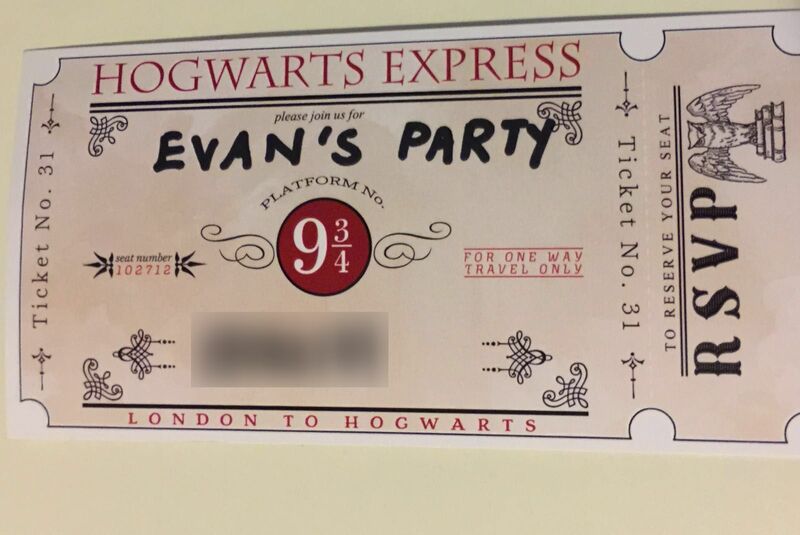 Packrat's idea of an invite was a replica of the Platform 9 3/4 train ticket on thick stock parchment-like paper. The point was an invitation that they could touch, feel and use as a bookmark after. My only wish is that he printed more because I would have liked a couple for myself. This image was designed by the twins' coach and it fit perfectly onto the invite. 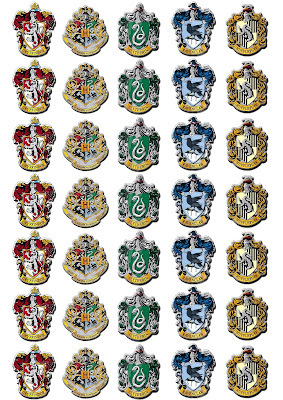 On top of that, between him and our very creative friend, L, we had House and Hogwarts stickers for both the 'Sorting' as well as for a strip to take home.They looked very real and every door in my house is now adorned with one. 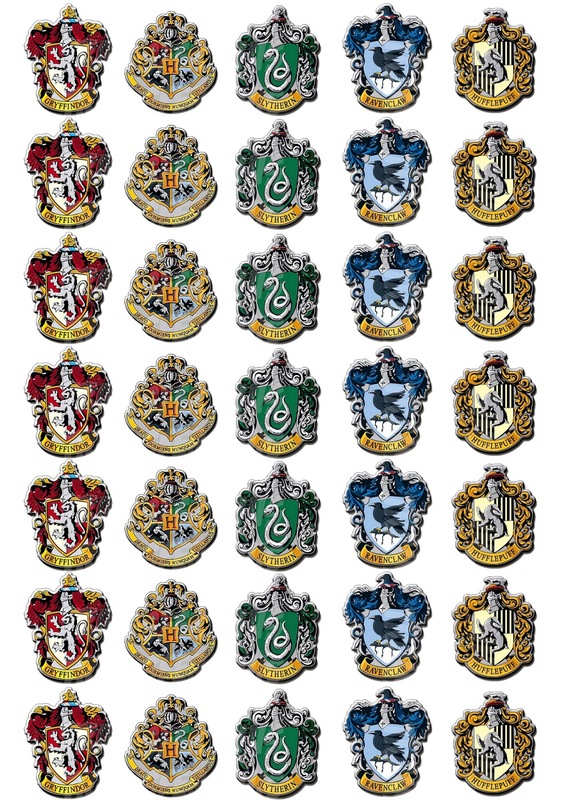 There is one thing I love about the twins' and their friends' love for the Potter universe and that is how truly it unleashes creativity in them (there's enough of that to fill another post). 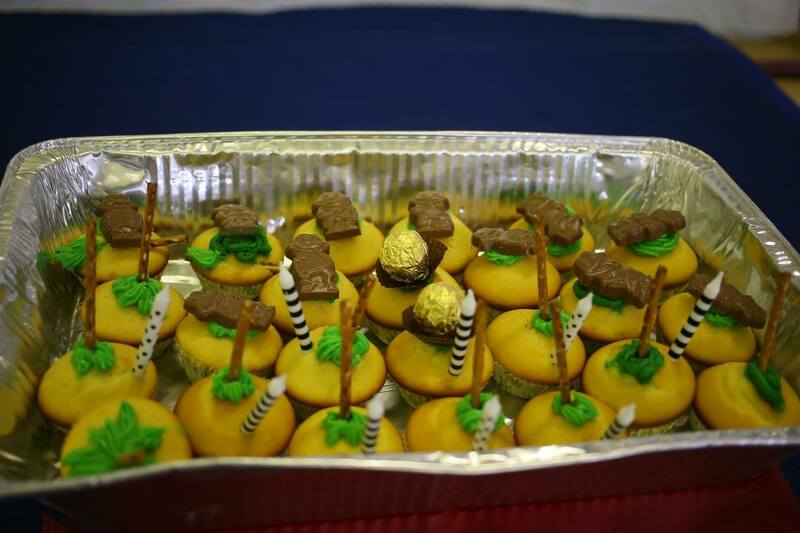 One of Jordan's best friends from school took it upon herself to bake Potter inspired cupcakes. 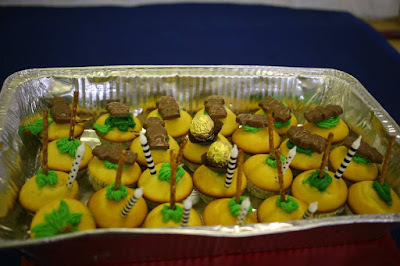 Chocolate Frog cupcakes, Broomstick cupcakes as well as two Snitch ones for the birthday twins. Even though we had store bought cupcakes for the candles and song, we ended up using these instead because they meant so much more to the twins. Part of all the fun was actually in all these little things. They did add very much to the colour and to the excitement of the party. But I'm pretty sure I can only do once every couple of years.